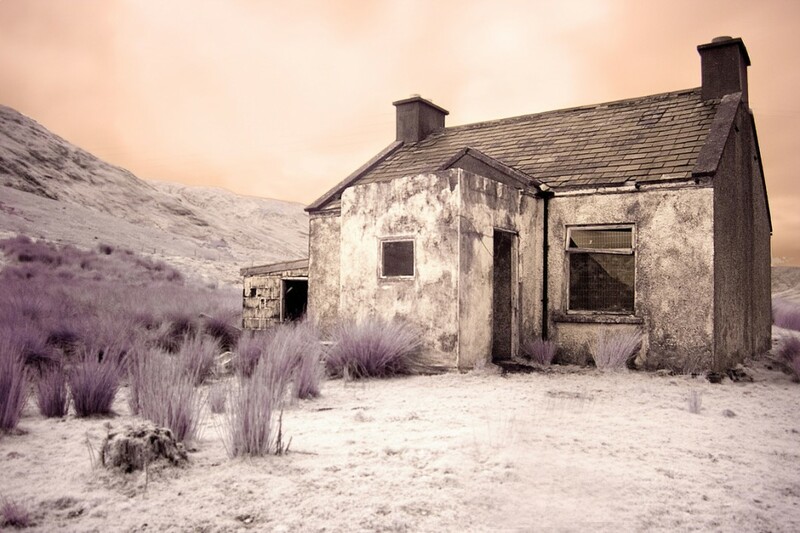 This photograph of an abandoned cottage was taken at the outskirts of Leenane village in Co. Galway. Leenane is nestled at the end of the stunningly beautiful Killary Harbour, a glacial fjord on the northern edge of Connemara. The cottage was the home of Bina McLoughlin up until her death at the age of 72 in 2001. Bina was a larger than life character who shared her tiny cottage on the slopes of the Maam Turk mountains with at least 40 cats, a peacock, donkeys, goats, sheep and a litter of dogs. Dressed in flowing colourful shawls with dark black ringlets and a booming voice Bina seemed like a character from a different era. She was such a dominant feature of the area that she soon became know as "Queen of Connemara". Visitors to the cottage where entertained by a never ending supply of stories and a great repertoire of ballads. I have been told that the cottage is an old school house from the late 19th century. This theory is supported by presence of a peeked elevation to the front of the roof which would suggest the porch was a later addition.